I know it’s mid-February already, but there’s no time like the present for the first blog post of the year! This time, I don’t really have any reasons for not updating as often as I can, but I know the cause of it: I’m just not feeling it. Ever since I’ve graduated, I feel uninspired and unmotivated to do anything at all. I guess it’s because I’ve been a student so long—with a fixed schedule and fixed resolutions to achieve—that when I am no longer under an academic calendar, I don’t really have a solid goal to do anymore. It’s as if I’ve been thrown in a dark maze with no source of light whatsoever. I’d have to figure out where things go from here. I guess you could say I’m still adjusting as I go. I’m currently helping out with the family business and am freelancing to keep myself busy, but it’s not as satisfying as I’ve hoped. I guess I just miss that sense of satisfaction when you’ve worked so hard on something that you’re truly passionate about and the results prove your time and energy to be really worthwhile. Right now, I feel like I’ve just been filling up on side quests with no “main quest”–to speak in videogame terms. Anyways (as I try to figure my life out some more), to quickly wrap up 2018, here are the last three months of my Hobonichi! Today, I was so happy to see that one of my favorite brands (when it comes to school supplies and other necessities), FILED, announced a challenge for October. It was no ordinary challenge, because when you do complete the challenge, you get one of their gorgeous planners (for year 2016) for free! So the challenge basically is to follow a day-to-day set of ideas and write about it / doodle it on a journal. Click here for more details. I am encouraging you to join! I just HAD to join! 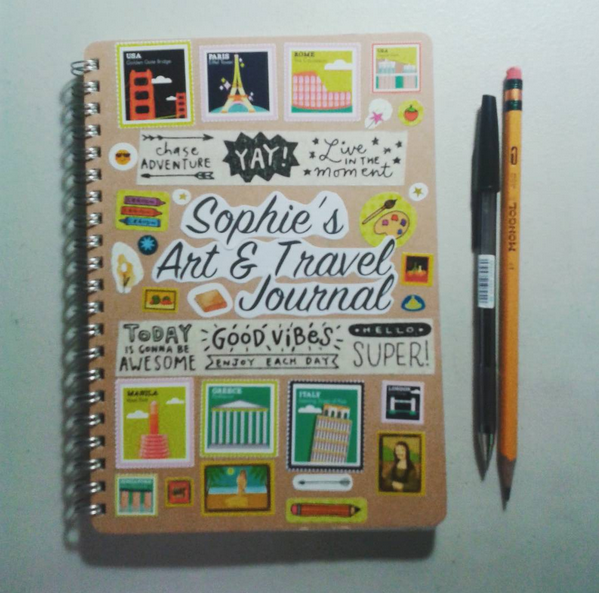 I am obsessed with their products (most especially their planner). In such excitement, I already picked out one of my best notebooks (my one and only Muji notebook) and started decorating the cover. Note: This post is no way connected or sponsored by Filed. *Stickers are from the book “1001 Stickers” (National Bookstore) and masking tape is by Ella Lama.